After my last week’s column for Maha Shivaratri, I had a flood of emails from readers across saying how I missed out on many other Shivas. As mentioned earlier, my piece was not meant to be a comprehensive list or any sequential order of the sculptures I wrote about. However, going by popular appeal, I decided to share a few more on the same subject. Once again, I am not going to go over dates, rulers, kingdoms and mythologies. All of them are well known. 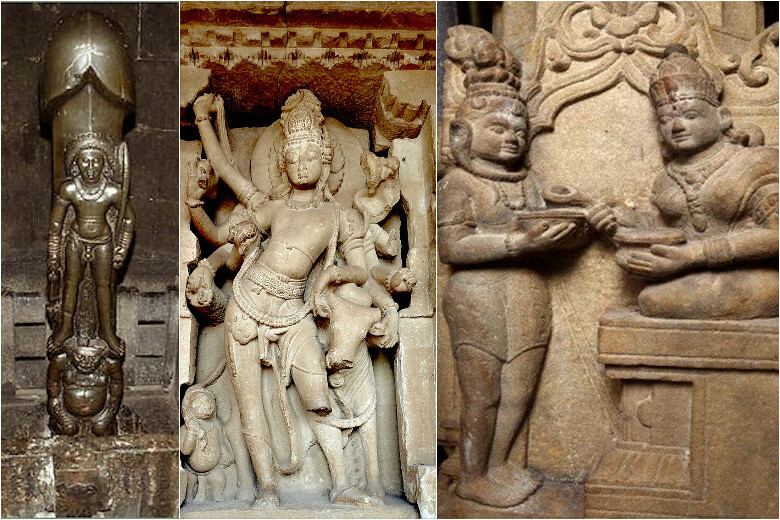 This is a list of some of the finest sculptures of Shiva seen across South in various heritage sites. I start with the second century temple of Gudimallam. Gudimallam is in the Chittor district of Andhra Pradesh. In the Srikalahasti Mandal, near Renigunta is an ancient temple of Parashurameshwara. Here Shiva is seen as a ‘Lingodhbhava Murti’, or one born of a Lingam. The very structure of the Lingam is seen here in a very literal representation. Shiva can be seen as a hunter. With his dreadlocks open, he is seen with an axe in his left hand and is blessing a ram with his right arm while standing on a dwarf. In his ears are a several ear rings and around his waist is a thin loincloth. If you notice, unlike other Shivas elsewhere, here the sacred thread does not adorn his body. The entire Lingam has seven facets and the whole sculpture is several feet below ground level. A low railing surrounding this idol has art motifs from the Buddhist and Jaina influences. It is said that once in sixty years this place gets completely submerged in water for a day. One is yet to understand the complex mystery behind this phenomenon. From there, to Sri Sailam in Telangana. Being one of the twelve Jyotirlingas, this is an important place of pilgrimage for everyone, especially Shivites. Here Shiva is worshipped as Mallikarjuna and his consort is Bramarambika Devi. The mythology of this place is fairly known. A significant sculpture in this temple is that of Shiva seeking alms from Parvathi who is in the form of Annapoorneshwari. As the goddess of food, she is seen seated feeding Shiva as he holds out his upturned skull for a bowl. Adi Shankara , the greatest philosopher of Advaita composed his famous epic poem ‘Sivananda Lahari’ on his visit to this temple. Shankara also installed a massive sculpture of the Sri Chakram Yantra in this same temple. In the ancient rock cut Ravana Phadi caves in Aihole in Karnataka built in 643 CE is yet another glorious dancing Shiva. 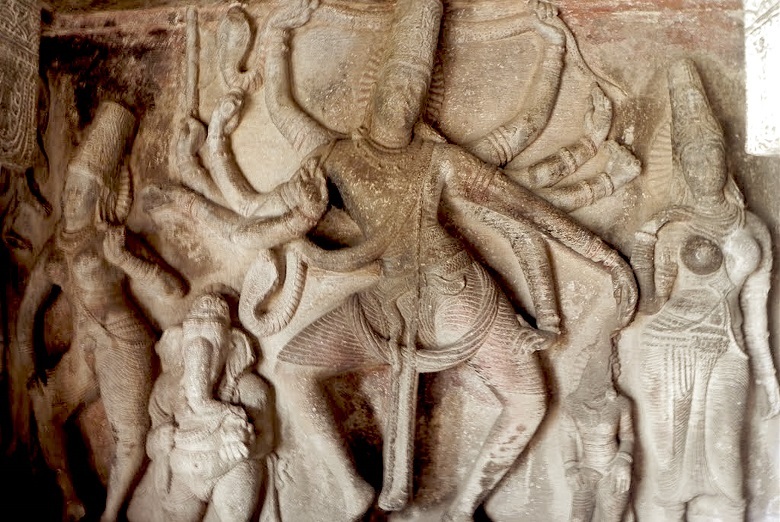 Shiva is seen with his ten arms dancing in abandon. In fact, two of his arms seem to have taken the snake from around his neck and are playing with it too. Around him are divine damsels. Near his right leg is Ganesha and his left is Nandi. This is one of the most beautiful versions of Nataraja. Dynamic in his dance and movement, this larger than life sculpture can be studied in great detail if you know the placement of hand movements according to the Natya Shastra. In and around the other places in Aihole are different other sculptures of Shiva. Shiva as Ardhanareeshwara and Shiva with Nandi are the two other significant ones. Both are sculpted out of a single rock and are filled with intricate details. In Belur and Halebidu, in the famous temples of the Hoyasala rulers, among scores of sculptures on the walls are some dedicated to Shiva. Particularly one dancing Shiva in the form of a Gajasamhara Murti at the Chennakeshava Temple in Belur. Carved out of a single piece of stone, this is an intricate sculpture with a lot of detailing. From Shiva’s very ornaments to the other smaller figures surrounding the central sculpture, one can see how much work has gone into the making of this one piece. 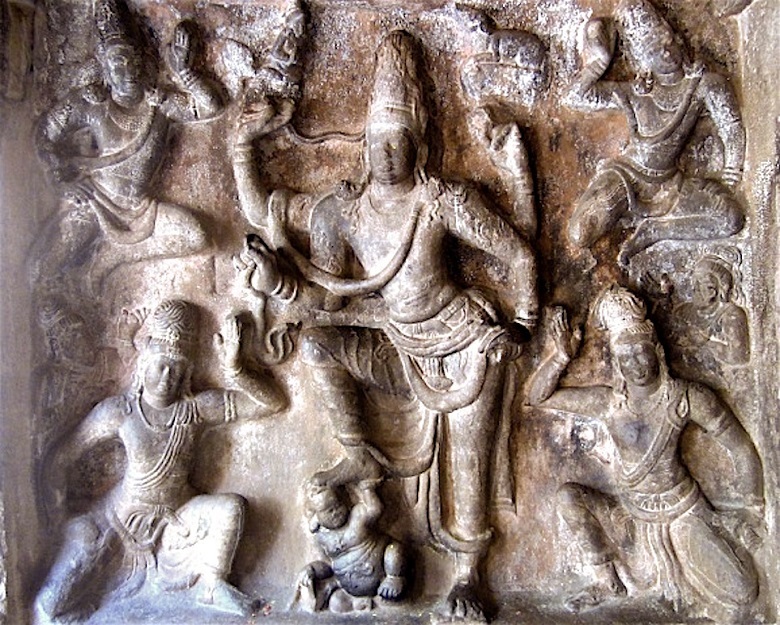 Down south in Tamil Nadu, in Gangaikondachola Puram, Shiva can be seen blessing the king Rajendra Chola. Known as Chandesha-Anugraha Murti, this sculpture is also a slice of history. Several epigraphers have said this was built during the coronation ceremony of the king Rajendra Chola who was called Chandesha. Shiva is seen putting a flower garland with his hands around the king’s head and blessing him. To Shiva’s left side is Parvathi seated facing front. This is one of the rare sculptures where one can also see how the ancient king might have looked like. Another sample of this can be seen at the Rock Fort Temple in Trichirapalli, or as the British called it Trichinopoly and is now known to us as Trichy. The original name of the place is supposed to come from Thirisimalai, after Shiva who slayed demon Thirishi but there is no way to verify this claim. Famous as Uchchi Pillayar Temple dedicated to lord Ganesha, this seventh century temple built by the Pallavas has been a pilgrimage site to the devout forever. The climb up the fleet of four hundred steep steps is a bit of trek. Half way up the temple in a rock cut cave is a relief of Shiva as Gangadhara Murti. The panel shows Shiva standing with his right foot on a dwarf. Divine damsels flank him on either side. One wonders how the sculptors of the Pallava rulers reached the heartland of the Chola Empire and found this secret place, climbed up two hundred feet and achieved this feat of sculpting this massive relief. Along side this is an ancient inscription written in an ancient meter of poetry. In the same Trichy is the famous Jambukeshwara Temple, again dedicated to Shiva. Known as the Thiruvanaikaval temple, it is counted as one of the five Pancha Bhoota Kshetrams in Tamil Nadu. This is a Jala Lingam or one associated with water. The central Garbah Griham of this temple is in water most of the times, even though the water is flushed out time and again. Shiva’s consort Parvathi here is worshipped as Akhilandeshwari. It was to this goddess that the famous Carnatic composer Muthuswamy Dikshitar composed his famous Kriti in Ragam Dvijawanti. Akhilandeshwari is supposed to have created this Lingam out of the waters of the Kaveri river and worshipped Shiva. In this temple is a sculpture explaining the Sthala Puranam of the place. According to lore, the name ‘Thiruvanaikaval’ that comes from ‘Thiruvanaikaadu’ has an interesting history. Malyavan and Pushpadanta, two Ganas of Shiva were quarrelsome. They cursed each other and as a result Pushpadanta was born as an elephant and Malyavan as a spider. They reached Jambukeshwara and continued their prayers to Shiva. 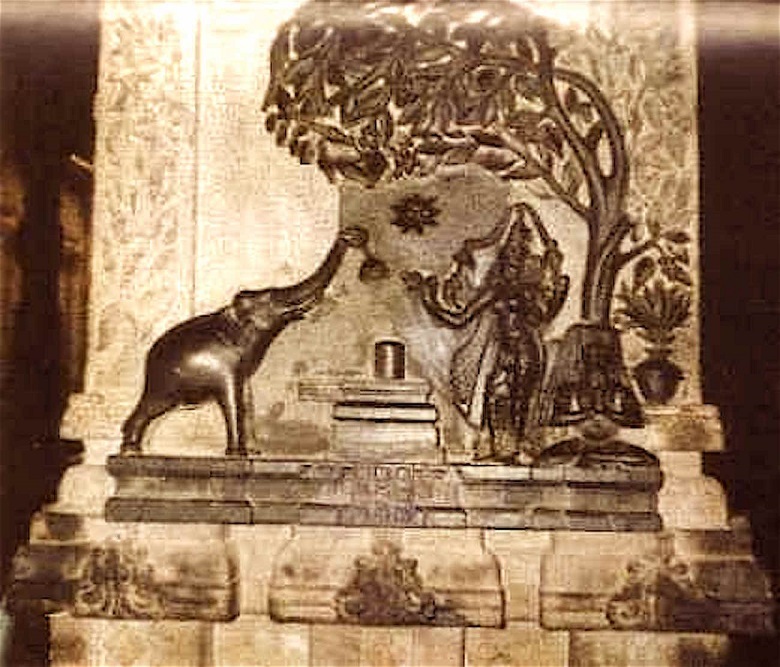 Everyday the elephant worshipped the Lingam with water from the Kaveri while the spider built his web above the Lingam and made sure no dry leaves from the Jambu tree fell directly on it. The elephant tore down the spider’s web and the spider crawled into the elephant’s trunk and killed it but biting him. Another story goes how the same spider was reborn as Ko Chengot Chola, the ruler who helped build the temple during his rule. However, pleased by their devotion Shiva released them from their curses. Since this was a place the elephant worshipped Shiva it came to be known as Thiru (holy), Anai (elephant) Kaadu (forest). This whole story can be seen on a little panel sculpted in the temple. There are so many more stories behind so many more sculptures across various heritage sites in South. The list is endless! I will deal with those later at another time. For now, enjoy these sculptures and marvel at a rich tradition that we seem to be losing by the day. We no longer have great sculptors who can create such masterpieces. Nor do we have Gurus who can teach the same. It is a lost art form. The only way we can enjoy it is through these monuments and preserve them for posterity.